"I've recommended you for a job in my company XYZ, to apply click on this particular link." That's the message mobile app myREF hopes to spread as it lends a helping hand to hassled HR managers trying to turn their employees into talent scouts. myREF, developed by former NIIT executives Suhaan Boxwala and Anuradha Boxwala, is a mobile-based employee referral platform that features specific referral campaigns, allowing employers to leverage the personal networks of its employees to influence and advocate job positions within an organisation. Eduwiz Consulting Services Pvt Ltd, which operates myREF, has three major clients currently - Concentrix (previously owned by IBM Daksh), 24-7 Customer, and EXL Services. With most of the pure-play employee referral programs still desktop-based, a mobile-based referral system presented an intriguing opportunity, says Suhaan Boxwala. "A mobile-based referral app can help employees refer a candidate anytime from anywhere," he says. When an employee downloads the myREF app, he/she can see the various referral campaigns on the app and click on any particular campaign to view the details. It will then open up a page that provides the details about the benefits and rewards the referrer gets and the qualification and experience criteria required for that particular job opening. The employee can then access the phone book while still being on the app and select friends he/she would like to refer for the job. Tapping next, the app will show a pre-scripted message from the company that invites the receiver to click on the link to apply for the vacancy. This message will be sent via SMS and email. myREF's service stops here and if the candidate chooses to apply for the job, the employer takes it forward from there. Meanwhile in the backend, the application captures all the data including the name, phone number and email address of the referrer and the candidate. The hiring company can also offer discount coupons or reward coupons which gets credited to the in-built reward wallet on the app for each referral. myREF also provides creative support to employers for customised emailers and creatives. myREF is also working on bringing social media interactions onto the app. Currently, Eduwiz has around 15 campaigns running on the app, targeting nearly 7500 registered employees, mostly from Concetrix, 24-7 Customer, and EXL Services. "We charge clients based on the number of campaigns it runs. There are a number of packages based on the number of campaigns it runs for a specific time frame," says Suhaan Boxwala. The app has run close to 30 employee referral campaigns so far and has generated around 16,000 referrals so far, Suhaan Boxwala claimed. "Right now, we are comfortable doing it on a campaign based model. The subscription-based model was discussed internally, but we haven't explored it yet. Right now, our focus is to get some traction while focusing on one particular method of selling," he said. Under the current model, clients are completely responsible for marketing the campaigns and myREF doesn't have much control on it. Therefore, a subscription-based model would not be possible in the current structure, he explained. Eduwiz initially targeted 10 per cent of the employees in every company to download the app, but Suhaan Boxwala claims that it sees nearly14 per cent download rates per each client now. myREF went live in October 2014, clocking revenue of Rs 11 lakh last year and is looking to touch Rs 50 lakh this financial year. The company is aiming to end the year with 10-12 clients. It is in talks with a number of companies, especially in the business process outsourcing space in India and international markets. Recently, it launched four referral campaigns for a company in Philippines and is in talks with a couple of companies from the US and Guatemala, a key BPO hub, said Suhaan Boxwala. myREF has already signed a deal with one of the leading e-commerce portals in India whose referral campaigns are likely to be launched soon. The online referral market has not seen much action when it comes to mobile apps. 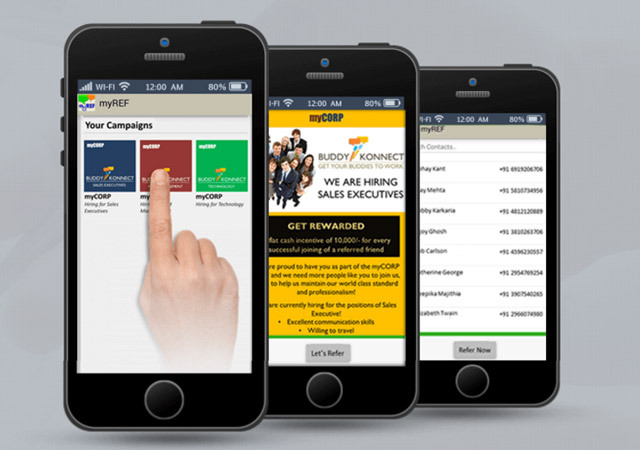 Happy2Refer is one of the few mobile apps in the job referral segment which connects to a referrer's networks and recommends who in the network is a great fit for a particular role. In 2014, Hyderabad Angels funded Bangalore-based WhistleTalk Technologies Pvt Ltd had launched a referral hiring mobile app for Android and iOS phones. Online job referral platform Round One helps users create profiles and then get calls or interviews arranged after making some payment to an existing employee. Round One recently raised an undisclosed amount in its pre-Series A round of funding from HT Media (owner of job portal Shine.com) and Arun Duggal, board member, Info Edge (India) Ltd, which owns India's first homegrown job portal Naukri.com. Delhi-based MyRefers works on a subscription model, wherein it gets paid by the companies it has on board. Once a job is converted, the startup offers money ranging from Rs 1,500 to Rs 5,000 to members who refer people. Eduwiz founders have invested close to Rs 50 lakh in the company and are looking to raise Rs 3 crore as it gains traction.